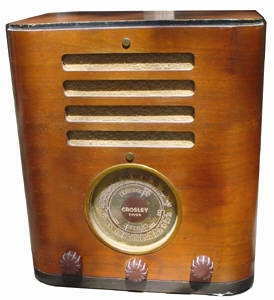 These Crosley "Fiver" radios came in various cabinet styles ranging from tombstones to tabletops and are well-known for the large brass round dial. This particular model came in a common wood tombstone-style cabinet. After replacing the power cord and a couple filter capacitors, the radio played well with a long antenna.